Pen-and-ink and water-colour drawing of the elevation of the Kollarama Temple at Kolar in Karnataka. This drawing is taken from an album of 156 drawings (185 folios) chiefly of architecture and sculpture in S. India, dated 1803-08. The drawing depict specimens of architecture mainly from Kolar, Sravana Belagola, Conjeeveram and Shimoga and sculpture from Halebid, Amritapura and various Jain monuments. Some drawings are by MacKenzie himself, others by his assistant surveyors and draftsmen, including H. Hamilton and J. Newman. Kolar, previously known as Kuvala-pura, was the capital of the Ganga dynasty who ruled in many parts of Karnataka until the 10th century. It was successively occupied by the Cholas, the Hoysala and the Vijayanagara rulers and later changed hands from the Marathas to the English and then the Mysore kings. The ancient Kollarama Temple was renovated by Rajendra Chola around 1040 AD. 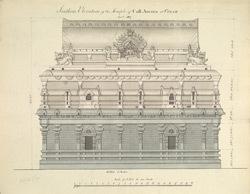 It is built in the Dravidian or south Indian style; this drawing shows the pyramidal superstructure ending in a vaulted roof over the sanctuary and the external pilastered walls with niches. The gateway is richly-carved with scrollwork and volutes containing mythological figures. The The temple is a centre of Shakti worship, a cult of ancient origins of the divine creative force of the goddess. The deity in the sanctuary was Mahishasuramardini, known as Kolaramma. This had replaced the original image of Kolarammma. The image has been replaced again by Saptamatrika figures.